As part of the 100th anniversary of Rotary International, the local branch of the service club joined Rotary Clubs world wide in undertaking special service projects. 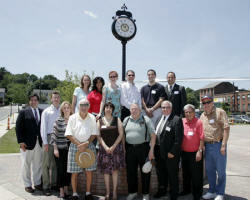 The Derby/Shelton Club decided to donate the clocks to the two cities served by the club. 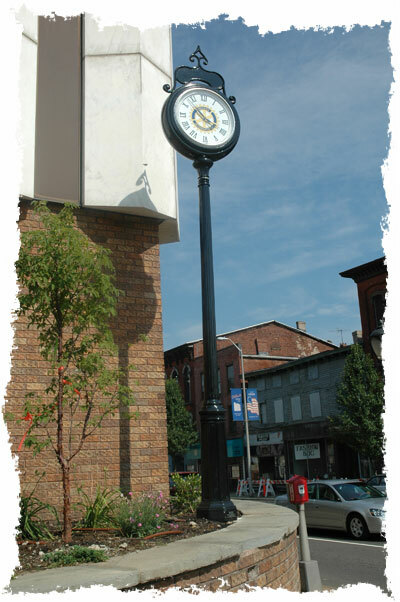 The clock is a great match for the existing street lighting scheme in the downtown area. The clock was installed just in time for Derby Day and the dedication was held immediately following the dedication of the city’s fabulous new Greenway. Officials started at 11:00 am at the Division Street entrance to the Greenway, walked the length of the trail to Main street where they cut a second ribbon. Following the ribbon cutting, they proceeded up Main Street to City Hall to dedicate the new clock. Shelton’s was installed along its burgeoning center of community activity in and around the Farmers Market on Canal Street. About 20 members of the club were on hand as Mayor Mark Lauretti officially dedicated the clock as part of a larger Flag Day Commemoration held under a large tent across from the Farmers Market along Shelton’s Riverwalk.